The US Ambassador to Nigeria, His Excellency, Stuart Symington, accompanied by the Political and Economic Officer from the office of the US Consulate, General Benjamin Williams, paid a courtesy visit to IITA on 28 August to meet the IITA Youth Agripreneurs (IYA) and learn more about the progress of the Youth-in-Agribusiness initiative. Ambassador Symington and Williams were received at the IITA headquarters in Ibadan by IITA Director General Nteranya Sanginga, and Deputy Director General for Partnerships for Delivery Kenton Dashiell, key IITA staff, IYA members, and delegates of the Ivorian government who were visiting IITA to learn about the Youth- in-Agribusiness program in preparation for the implementation of the ENABLE Youth program. 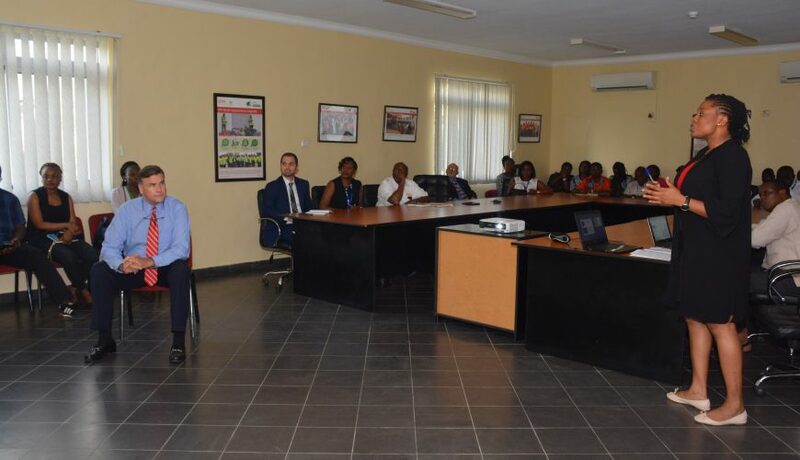 Evelyn Ohanwusi, Interim Head, IITA Youth- in-Agribusiness Office, gave an overview and update of IITA’s youth agribusiness initiatives, especially highlighting the ENABLE-Technologies for the African Agricultural Transformation (TAAT) program. She emphasized the program’s goal of investing in about 32 African countries, which she said can easily be achieved by having the right partners and investors who believe in the youth thriving in agriculture. Ibukun Agbotoba, co-founder of Afribroiler Ltd, one of the agribusinesses incubated in the IYA program, talked about her experiences in setting up her business. Afribroiler aims to grow a franchise network of small-scale commercial feed-to-fork broiler enterprises. Together with partners, they will establish a reference-farm with feed mill and breeding, incubating/hatching, growing, processing, and retail/food units for research, training, and demonstration. Ambassador Symington asked questions and expressed satisfaction about the youth initiatives and IITA’s transformation agenda. He also encouraged the youth to work as a team to achieve the common goal of building successful business empires in the future. He encouraged them to be “amazing” saying, “As future leaders, do not leave anyone behind. Williams, visiting IITA for the first time, was amazed to see young and energetic youth working to make Africa a food-secure continent while expressing admiration for the work that IITA is doing especially in creating jobs for youth across Africa.